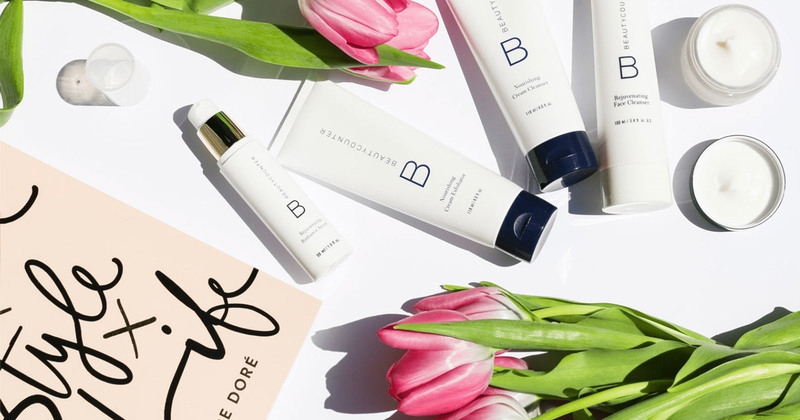 Beautycounter has thrown the cosmetics and personal care world for a loop. The company was founded by Gregg Renfrew, a self-described wife and mother of three who started her business career in her early twenties by launching a house cleaning service on Nantucket. She, along with a partner, later built a successful bridal registry business, sold it to Martha Stewart, got hired to run children’s retailer Best & Co, got fired, and ended up in a movie theater watching Al Gore’s “An Inconvenient Truth.” That movie and various conversations with trusted friends helped Renfrew realize first, she wanted to stop putting products on her kids’ skin and her own face that contained chemicals like mercury, formaldehyde, and coal tar, and second, she wanted to build a business to make that happen. The idea for Beautycounter was born. Fast forward five years, to today. The company, whose stated mission is “to get safer products into the hands of everyone,” has become a leader in the fastest growing sector of the $62 billion cosmetic industry, the non-toxic beauty and personal care products lines. It’s innovating product formulations, revolutionizing sales and marketing strategies, and creating a passionate following of raving fans – and buyers – along the way. We recently spoke with Lindsay Dahl, Beautycounter’s Vice President for Social and Environmental Responsibility, to discuss the company’s phenomenal success – and how it intersects with two Good Life principles Sustainable Brands is shining a spotlight on this year: balanced simplicity and meaningful connections. 1. What was the inspiration behind Beautycounter’s innovation? How do your products connect with the principles of balanced simplicity and meaningful connections? Beautycounter is innovative in the products we create and sell, how we distribute them, and our unique dedication to advocating for more health protective laws on our own industry. As the leader in clean beauty, we take tremendous pride in how we carefully screen ingredients for safety, while still ensuring they perform to our clients’ high standards. For us, it’s not only about the 1,500 ingredients we have banned from our products; it’s about screening those that we do use for safety. Gregg Renfrew, Beautycounter’s Founder and CEO, started the company using a “direct retail model,” challenging the industry trend of selling either in stores, online, or via a combination of the two. Our direct retail model is as disruptive as our product formulations and is composed of three channels: direct sales through our network of more than 26,000 independent Consultants, our e-commerce website, and strategic partnerships with retailers like J Crew, Target, Serena, and Lily, among others. In particular, our platform allows women and men the flexibility to balance work and family as well as the opportunity to earn income full or part-time while having significant social impact. Moreover, many of Beautycounter’s Consultants work together, which results in a sense of community and fosters friendships and connections cross-country. We believe that the educational nature of the business—teaching friends and family members about how to find safer, less toxic products—naturally lends itself to meaningful interactions with loved ones. In that line of thinking, we’re not a beauty company – we’re a movement. In addition, advocacy and education on the need for better beauty laws was built into the DNA of Beautycounter from day one. Not only is Beautycounter a leader in the fight to reform our outdated cosmetics regulations, we have empowered thousands of women across the country and across North America to participate in the democratic process. 2. How do Beautycounter’s products reflect the true north star of the brand? How do they deepen relationships with customers and other stakeholders? Beautycounter’s mission is to get safer products into the hands of everyone; our products reflect our commitment to our clients to never use ingredients that are known to be harmful to human health. To ensure that our health and safety standards go well beyond what is legally required in the United States, we created The Never List, which is made up of more than 1,500 questionable or harmful chemicals that we never use as ingredients in our products. We then go on to screen ingredients to make sure they aren’t linked to hormone disruption, cancer, and other health endpoints. The true magic in Beautycounter is the intersection between safer, cleaner ingredients, while still creating products that perform just as well as department store brands. This tireless dedication to safety and performance is what drives us. 3. How is Beautycounter delivering positive social or environmental impacts? Can those impacts be quantified? We are making significant strides in DC by asking Congress to fix the root of the problem, our broken laws when it comes to the personal care industry. Our tireless work in state legislatures and Washington, DC, in addition to our Consultants and clients actively asking Congress for better beauty laws, demonstrates our dedication to long lasting social impact. When Beautycounter began working on cosmetics reform nearly five years ago, consumer awareness of this issue was virtually nonexistent. Since then, through empowering our Consultants with the information to educate friends, family, and clients on the need to update regulations governing personal care products, we have created the cultural climate that laid the foundation for current political action in the nation’s capital. Over the past few years, our Consultants have made more than 3,500 calls, sent more than 85,000 emails and attended more than 650 meetings with policymakers asking for legislation to fix our broken cosmetics regulatory system. As a certified B Corporation, we believe that profits should never come at the expense of people or the environment. To become B Corp certified, companies must meet high standards of transparency, accountability, and social and environmental good. This past year, Beautycounter earned our highest score ever, 95, which reflects our company’s commitment to responsible stewardship of the community and planet. In addition, Beautycounter also received the highest score (92) out of 25 businesses taking part in the Chemical Footprint Project, which measures and discloses data on business progress to safer chemicals. We achieved this ranking based on our efforts to reduce the use of harmful chemicals and replacing them with safer alternatives, disclosing this work publicly. 4. How are positive social and environmental impacts being communicated? Is there a clear story about how this product or initiative is benefiting society? We do our best to communicate our mission and impact at every touch point. From educational emails, to social media, we weave in our products and mission, since they are one and the same. We were proud to publish our first ever Corporate Sustainability Report in 2017 and look forward to updating this as the years progress, sharing our goals with the community at large. 5. What is the business case? Is your innovation delivering a positive ROI? The beauty business is a $62 billion industry and safer beauty companies are the fastest growing segment within the industry. Consumers are becoming more sophisticated purchasers of personal care products, demanding to know what is in products and what effects the ingredients used in those products have on human health. Beautycounter has been an industry leader in transparency and clean cosmetics since our founding. This means that despite limited advertising, our products have reached millions of people simply through the efforts of our Consultants and by word of mouth. Clients know that they can trust our products are safe to use on their families, building brand loyalty at a time when there is a high level of mistrust about whether companies have their best interests at heart. The business case is clear: more and more people are purchasing clean beauty products and staying loyal to companies that not only use safer ingredients, but also share transparently. Participate in Sustainable Brands’ annual flagship event, SB’18 Vancouver: Redesigning the Good Life, to learn how and why companies around the world are embedding “The Good Life” principles like transparency and purpose into their brands to grow their businesses in this new economy, and gain the tools to do the same for your brand.